About - RODNEY L. HURST, SR. - THE STRUGGLE CONTINUES! Rodney Lawrence Hurst, Sr. is a civil rights activist, a Black historian, and the author of two award-winning books--It was never about a hot dog and a Coke®! A personal account of the 1960 sit-in demonstrations in Jacksonville, Florida and Ax Handle Saturday, and Unless WE Tell It…It Never Gets Told! which deals with Jacksonville Black History, Jacksonville's Civil Rights History, and Confronting Racism. It was never about a hot dog and a Coke®! recounts with clarity the segregated civic, the segregated political, and the segregated educational climate of Jacksonville Florida in the 1950’s and the 1960’s. Hurst, a native of Jacksonville and a 1960 high school graduate of segregated Northwestern Junior-Senior High School in Jacksonville, was the sixteen-year-old President of the Jacksonville Youth Council NAACP and was one of the leaders of the 1960 sit-in demonstrations. He tells the real history of the bloody events of August 27, 1960, when 200 whites with ax handles and baseball bats attacked members of the Jacksonville, Florida Youth Council NAACP who were demonstrating peaceably at White lunch counters in downtown Jacksonville; and also attacked anyone Black in downtown Jacksonville. The press calls that day Ax Handle Saturday. Due to the “blackout” of news during those days of segregation, Hurst’s book detailing his eyewitness account is the only historically accurate description of the 1960 Jacksonville sit-ins and Ax Handle Saturday. It was never about a hot dog and a Coke®! is the winner of more than a dozen awards, including the 2008 USA National Best Books Awards national book competition First Place Gold Medal Award for Multicultural Nonfiction, the 2009 Florida Book Awards Bronze Medal in Nonfiction, The 2008 Sabrina Best Book Awards for Non-Fiction national book competition, and the 2009 Independent Publisher’s Silver Medal for Best Regional Non-Fiction book competition. His book was also recognized by the Florida Historical Society with its First Annual Stetson Kennedy Award. His second book “Unless WE Tell It…It Never Gets Told!” published in January 2016 relates stories of notable Blacks of Jacksonville who impacted this city and the country, relates stories of America’s Black History, and relates stories of the historical fight against Racism. It was recently honored as one of five finalists for the 2016 Multicultural Non-Fiction Award by the National Best Books Awards national book competition; and the 2017 Jacksonville Historical Preservation Commission Award. The documentary, Ax Handle Saturday: 50 Years Later, is based on his book. Hurst’s leadership as a teenager during the Civil Rights Movement is also the subject of a chapter in the Scholastic book, Ten True Tales: Young Civil Rights Heroes written for Third Graders to Seventh Graders and ages 8 to 12. 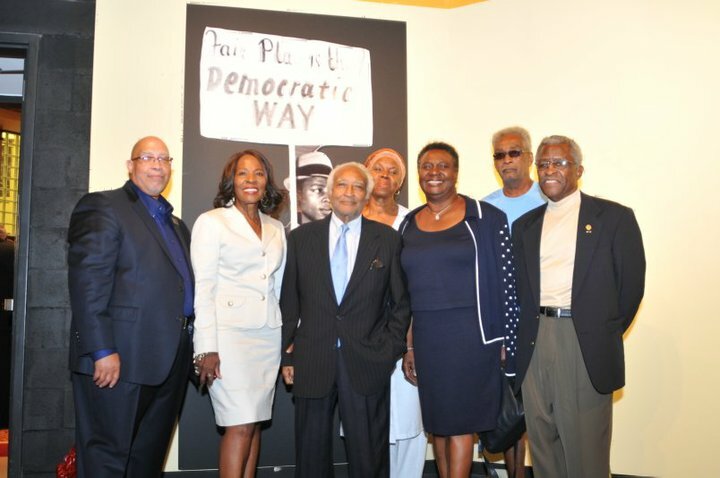 In addition to his involvement in the Civil Rights Movement, Hurst served two four-year terms on the Jacksonville City Council. He is responsible for a number of “firsts” in the Jacksonville Community: He was one of the thirteen original national recipients of the Corporation for Public Broadcasting Television Fellowships; he was the first Black to co-host a television talk show in Jacksonville on PBS Channel WJCT; He was the first Black male hired at the Prudential South Central Home Office in Jacksonville, Florida; and He was the first Black to serve as the Executive Director of the State of Florida’s Construction Industry Licensing Board. A Life Member of the National Association for the Advancement of Colored People (NAACP), Hurst is involved with a number of Boards and Agencies in the Jacksonville Community. He is a veteran of the United States Air Force. Hurst speaks extensively on Civil Rights, Black History, and Racism. He was the featured speaker at the City of Jacksonville’s 23rd Annual Martin Luther King Breakfast, the featured speaker at the Nassau County Annual Martin Luther King Breakfast, and the featured speaker for the Brevard County NAACP Branch Freedom Fund Dinner. He also was the keynote speaker in 2013, at the Induction Ceremony of the Florida Civil Rights Hall of Fame when Harriette and Harry T. Moore were inducted. Hurst speaks at college and university campuses throughout the state of Florida and the country. Hurst periodically teaches a "Black History, Civil Rights, and Racism" Class in the University of North Florida’s OLLI (Osher Lifelong Learning Institute) Program. Hurst is the recipient of numerous awards including The James S. Genwright, Sr. Humanitarian Award given by the Lincoln Douglas Memorial Emancipation Proclamation Association, Inc., the Clanzel T. Brown Award given by the Jacksonville Urban League, the Dr. Mary McLeod Bethune Visionary Award given by the National Alumni Association of Bethune-Cookman University, the Outstanding Alumnus Award by the National Alumni Association of Edward Waters College, the President’s Award by the President of the Jacksonville Branch National Association for the Advancement of Colored People, and the OneJax Silver Medallion Humanitarian Award. Hurst nominated both his mentor Rutledge H. Pearson and his good friend Dr. Arnett E. Girardeau to the Florida Civil Rights Hall of Fame. Mr. Pearson was inducted in the Hall posthumously, in June of 2016, and Dr. Girardeau was inducted in June of 2017. Dr. Girardeau passed four months later. Hurst and his late wife Ann (June 24, 1945-September 5, 2016) would have celebrated their Fiftieth Wedding Anniversary on December 10, 2016. Hurst has two sons, Rodney (Vandlyn) and Todd, and two granddaughters, Marquiette, and Jasmine. He worships at St. Gabriel’s Episcopal Church and Bethel Baptist Institutional Church.